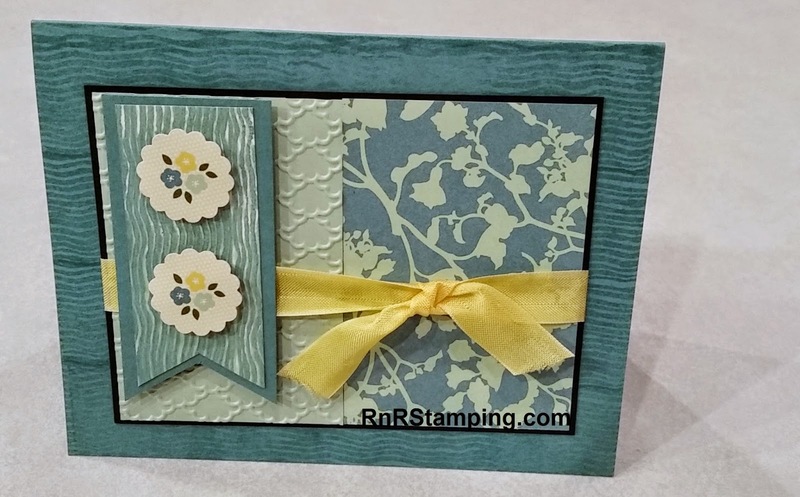 RnR Stamping: PPA Challenge - Play along with the Pals! I've mentioned before that the layout challenges often times cause me to do some serious thinking and this week's challenge is no exception. Although I like the clean and simple look, I frequently think my cards look naked, so I then proceed to dress them up a bit more, which is what I did with the layout challenge for this week. The fun thing with these challenges is the ability to see the basic idea and run with it. Come on! Give it a try - play along with the Pals! This is so sweet, Sue! It doesn't look like you were challenged at all, everything looks perfect together and I love the pretty flowers in the scallop circles. Thanks so much for joining us at the PPA this week! Every week I am awed by the creativity of the participants who open my eyes to see my tools and DSP in a whole new way. You did that with your scalloped punch of the flowers from one of current DSP stacks. So simple yet it created the perfect finishing touch. Sue, very cool interpretation of the sketch!!! Thanks for sharing your inspiration with the PPA this week! Love your take on the sketch! The colors and textures are really wonderful! Thanks for sharing with us at Pals Paper Arts this week! You did a fabulous job with the sketch. I love the way you used so many different papers. The embossing is also spectacular. Thanks for playing with the pals this week – you did a great job!